Karla Colletto "Juliet" one-piece swimsuit in solid microfiber. For in-store inquiries, use sku #2590634. Exclusively ours. 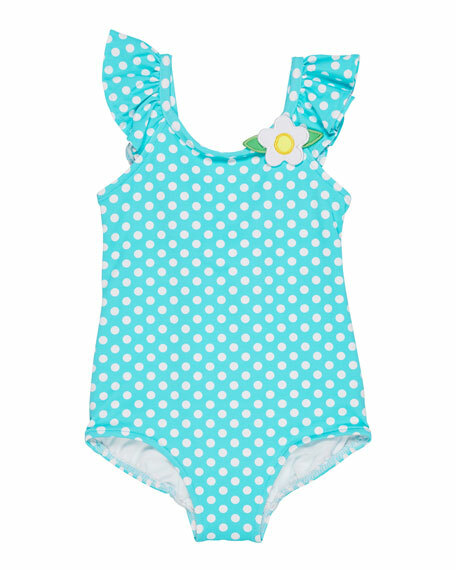 La Petite Robe di Chiara Boni "Atlante" one-piece swimsuit in solid microfiber. Dramatic ruffle trim that wrap diagonally around bodice. One-shoulder neckline. Classic silhouette. Full seat coverage. Nylon/spandex. Made in Italy. Florence Eiseman solid rash guard with flower appliqus at contrast ruffle hem. Crew neckline. Long, raglan sleeves. Hipster bottoms. Contrast ruffle trim at leg openings. Full seat coverage. Nylon/spandex. Imported.